Need a quick, no preparation icebreaker that works like a charm to break the ice in a meeting or training session? Highly adaptable, this icebreaker leads the participants right to the content of your meeting or training class. Here, see this one-word icebreaker and suggestions about how to endlessly adapt this icebreaker to your participants' needs. Sometimes, the seemingly most simple icebreaker will help you more than an elaborately developed and painstakingly prepared complicated icebreaker. You can figure out the one word to solicit the reactions of your attendees on the fly and then, devote the rest of your preparation time to the content of your meeting or training session. Tell the newly formed groups that their assignment is to think for a minute and then to share with their group the one word that describes X. In the first venture with this icebreaker, leading a session on organizational culture, the request from the group was that they think about their current culture and come up with one word to describe it. This icebreaker helps the group explore their thoughts on a common issue. This icebreaker is a perfect segue into the topic of the meeting or training class. The group was fascinated by the variety of the words chosen by the other participants to describe their culture. This icebreaker sparked spontaneous conversation in every group as the participants questioned each other about the meaning of their one word. They asked for examples and found that the combination of the participants' chosen words did describe their current organizational culture. Next, after the participants have listened to the variety of words from the larger group, ask them to explore several questions in their small group. In this instance, asking each participant to select one word to describe their organizational culture, the participants were then asked these follow-up questions. Is this culture consistent across buildings and departments? Is this the culture that you want to have in your organization? Does this culture support the accomplishment of the environment you desire for employees and the achievement of your company goals? Your opportunity for follow-up questions is endless. These debriefing questions can support the content of your training class or meeting. 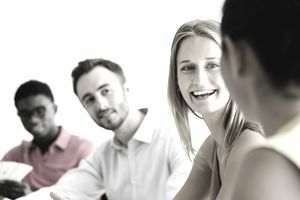 Because your participants are almost always your best source of laughter and fun in a meeting or training session, each of these steps generated remarks, insights, ah-has, and examples. Upon completion, move into the rest of the material you have prepared for the session. This one-word icebreaker takes 10–15 minutes with the initial enthusiastic, unstructured discussion that the icebreaker generates. Total time will depend on the number of additional questions that you ask the group to discuss as part of the debrief of the one-word icebreaker. While this one-word icebreaker was developed for the above-described session about organizational culture, the applications of the one-word icebreaker are limited only by your imagination. Here are a few ideas for adapting the one-word icebreaker to your needs. Session About Teams: what is one word that you would use to describe your team? Session About Communication: what is one word that you would use to describe the effectiveness of your communication? Regular Weekly Meeting: what is one word that you would use to describe how work is going for you this week? Or, in one word, describe your most significant challenge this week. Managing up Session: in one word, how would you describe your relationship with your boss? Session About Empowering Employees: what comes to your mind first when you think about empowering employees? A Class About Performance Management: what is one word that describes your current employee appraisals? Session About Interpersonal Communication: what is one word you would use to describe the communication skill you are most interested in developing? For a Session on Conflict Resolution: what is one word that describes how you feel when you think about having a conflict with a coworker? Please note that each of these examples provides an excellent opportunity to segue into the content of your meeting or training session. They also serve as a simple needs assessment for what your content needs to cover to meet your participants' needs.